Remember how I've said in the past that I can take a little tweaking of a story from book to screen so long as the movie holds true to the spirit of the book? That's very true. I don't mind a few "adjustments" at all when necessary to translate the written story to a visual. And so it follows that if the new Voyage of the Dawn Treader movie had held to the original spirit of C.S. Lewis' masterpiece, I would have ignored any changes and told you I loved the film. If. Ah, if only. Lucy and Edmund are returned to Narnia along with their cousin Eustace. They are placed on board the Dawn Treader where they are reunited with Caspian who is searching for the seven lost lords of Narnia. They travel to various islands in search of the lords and on each island they encounter a different adventure which teaches a different spiritual lesson or principle. But apparently the screen writers and producers didn't see that and felt the need to come up with a plot that would "make more sense" of the story. However, if you are a long-time lover of Narnia and a stickler for certain details, the "screened up" version of the story jolts you from known reality and leaves you feeling more bereft and confused than before you took your seat in the theater. Lucy and Edmund are returned to Narnia along with their cousin Eustace. They are placed on board the Dawn Treader where they are reunited with Caspian who is searching for the seven lost lords of Narnia. They travel to the lone islands whereupon they discover that an evil of some sort is taking over the seas and demands human sacrifices. Unstopped, this unknown evil that appears in the form of green gas (and resides on the Dark Island) will take over the world. Caspian and Edmund vow to destroy this evil and save all of the lost souls who have been sacrificed to the green gas. In order to destroy the green gas, they have to collect seven magical swords which Aslan gave to each of the seven lost lords and place all the swords on Aslan's table. Only then will this evil be stopped. Already there are too many liberties. They messed with the plot. They tried to make it more complex and modern and so ruined the purity and simplicity of Lewis' tale. All this I could have forgiven and more, had they traveled to the Islands at least in the order they appeared in the book and had the movie correctly translated the spiritual principles which exist in the story. 1. First Adventure (Island of Felimath) - The crew of the Dawn Treader are taken as slaves and sold. In the book Caspian tells his shipmates not to make known their positions of royalty but to keep their identities quiet until such time as it would be beneficial to make themselves known. In other words, Caspian cautions the crew to be wise as serpents but harmless as doves. In the movie Caspian immediately declares his kingship, which doesn't go over very well. But he is made aware of the evil green gas and so declares a new mission for the Dawn Treader and so on we go. 3. Third Adventure (Sea Serpent) - In the book this adventure takes place on the sea. Bravery and endurance when the going gets tough are described. In the movie, the sea serpent appears because of Edmund's fear and they battle the serpent next to the Dark Island. The serpent is so ugly there is no way I could show this film to my kids for YEARS. 6. Sixth Adventure (The Dark Island) - In the book their trip to the Dark Island is rather short for they realize their danger fairly immediately. In the movie The Dark Island is the scene of all of the evil and is, in fact, the very last Island that they visit in order to nab that seventh magical sword. 7. Seventh Adventure (Ramandu's Island) - I'm getting tired of typing. You never meet Ramandu in the movie and his daughter is a Beautiful Blue Star who takes the form of a beautiful female for Edmund and Caspian to admire. Seven swords laid on Aslan's table to break the spell of the green gas. Blah, blah, blah. 8. Eight Adventure (Reepicheep sails to Aslan's country) - In the movie he is accompanied almost all the way there by Caspian, Edmund, Lucy and Eustace. No explanation is given as to how BIG a deal this is to Reepicheep. Caspian is represented as being tempted to go on to Aslan's country but no one tries to stop him or shake some sense into him. He just magnanimously decides on his own that it's not time yet. In the movie Lucy asks Aslan, "This is our last time here, isn't it?" (Why, how smart of you, Luce!) She asks him if they will ever see him again. He responds to her, "I will be watching you." I almost lit out of my chair in a rage, hoping that they would decide to complete Aslan's instruction to Lucy. Tears came into my eyes when he told her that in her world, he has another name. The reason she was brought to Narnia in the first place, was so that she could get to know Aslan and so it would be easier for her to find him in her own world. And I thought to myself that if they had followed the book more closely and accurately, I would have bawled my eyes out through the whole thing. Lewis had such a way with words and a magical way of telling stories. Why they would try to change those stories is beyond me. In the end, I cried twice. 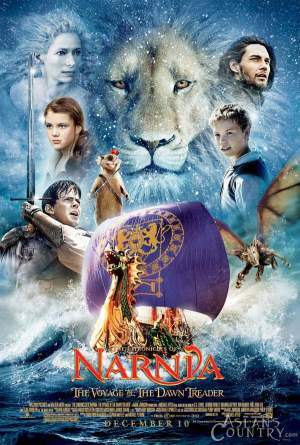 I cried when Lucy and Edmund were hoisted onto the Dawn Treader and were overjoyed because they were in Narnia again. I was overjoyed too. I might have cried harder if I had known what was coming and how the story was about to be deranged but I didn't know better then.) I cried at the end when they allowed Aslan to speak the words that Lewis wrote which are powerful and impacting. Otherwise, I watched the film and agreed with Eustace's line: "This just keeps getting weirder and weirder!" With that token of niceness, I now feel allowed to tell you that I really didn't care for the film a bit, am greatly disappointed and am going to purge and cleanse my mind by re-reading the story as soon as I possibly can. Oh, and by the way, I remained in my seat the whole time until Carrie Underwood started singing at the conclusion of the film about how, "We can be the kings and queens of anything if we believe....." at which point I told Jonathan I had to leave the theater.... NOW! We'll be waiting for the DVD for sure now. Earlier in the month we talked of actually getting a babysitter, esp since I had heard it was good. I do not know what that was referring to. The first time I had read VotDT I didn't love it. I really got into it this summer though and the previous read. Thanks for the fair warning! We saw it yesterday too. I agree with your observations. For some odd reason it doesn't bother me as much... maybe because it wasn't far into the film when I realized, "Okay, this isn't really Dawn Treader. It's a whole different story." I shifted gears and enjoyed it as a movie -- but not as a movie that was supposed to be DT. Great review (even if it wasn't a terribly positive one). : ) I'm forwarding this to my husband ... I'm thinking it's a wait-for-video for us. It seems like people either love it or hate it. The people who have read the story don't like the movie. Those who haven't or haven't read it since childhood do like the movie. I will probably wait until video to watch it. OH MAN! I'm sorry that they changed things up so much. I truly don't understand why Hollywood does this. Especially with a movie that's based on a widely known and loved book! It's very frustrating to see a story you love butchered!! I can only hope that the movie will cause viewers to pick up the book and read the real story for themselves. I finally found someone who also didn't like the movie! I went to see the movie this past week and really didn't like it...for many of the same reasons you mentioned. In fact, the only things I loved about the movie was the actor who played Eustace; he was perfect! And the ship looked just like I've pictured it. Anyway...everyone else I know who has seen the movie really enjoyed it. I wrote a review on my blog of the movie as well. Yeah. I didn't get why they changed the plot the way that they did. It was explained in the book that Lucy and Edmund had sailed to a number of the islands that they visited and that's why Aslan thought they'd been useful on the trip. Why did they change Caspian's accent in this movie? In Prince Caspian it was Spanish. Now it was British. We saw some friends of ours at the theater and they LOVED it. So I asked them if they had read the book any time recently and they hadn't. I think that's the key. if you haven't ever read the book and/or it's been a long, long time then it's probably going to bother you a lot less. But that alone bothers me because this Hollywood-ized version of the movie is watered down Christianity. "Believe." (In what!?) "Be yourself." (Is that necessarily a holy thing to do?) And "battle evil!" (Which, these days, is never so clearly defined that you could positively know which end is up and which end is down!) It's very loose and free. That's how the movie strikes me. Yes, you can have those feel good feelings of battling evil. But again, the evil in the movie is NOT clearly defined. Some gas. Unnamed. Unknown. Vague. So throw some magic at it and hope for the best? The book, on the other hand, was written by a theologian and a genius who PACKED his story with truths you could grasp hold of and actually set about believing in. It's just a half-baked film and I think that's what bothers me more than anything. You expressed my feelings exactly! I loved the ship and I thought the actor who played Eustace was great..I also thought the way they entered Narnia through the picture was well done and true to the book....but I could not believe all of the other changes that were made! This is so disappointing to hear. I was hoping to go see this with my hubby sometime soon, but after reading your review, may wait until video...or never. I hate how hollywood takes a perfectly well written story and makes it their "own". Especially christianity ones. It is very upsetting. At least we still have the original, unchanged, text, the way C.S. Lewis intended, and our imaginations to make it come to life. That is the #1 greatest thing about books! Dh and I finally got to see it today, and while I didn't react quite as negatively as you, overall I thought it was just... meh. I haven't read DT in a while ( with my memory, I would've had to have read it yesterday to really remember it! ), but I do remember enough to know they made the dragon scene totally devoid of the truth and power it contains in the nook. Figures. I hope they don't butcher Silver Chair because Puddleglum is one of my favorite characters. This is so disappointing to read. We've been looking forward to this moving for a l-o-n-g time. Wanted to take the kids to the theater to see it. We love the books, and this one, in particular, is a favorite. My kids were upset with the changes in Prince Caspian, so I'm sure this will be a disappointment. Maybe we'll catch it on video. Thanks for the heads up. And I am so glad to hear the green mist was not part of the book; I thought that was such a dumb effect! We the moviegoers are smart enough, in my opinion, to realize when the heroes are being tempted to evil!! Ugh... I only skimmed because I haven't watched the movie yet and don't want to completely dissapoint myself before seeing it. I'm hoping to see it this week with my fam. I'll read this post fully after I see it. Well, BUMMER! I've been enjoying reading this book and am sorely disappointed that the movie so twisted Lewis' story! Maybe we won't try to see it in the theater, now. Sad! Ugh, Carrie Underwood? Really? I guess that does sort of sum it all up somehow. :( I'll go see it just for the sake of that Eustace actor. I've heard more than once that he was really great. Too bad. Why couldn't these movies have been wonderful? Thanks VERY much for the review though. I'd rather have my suspicions confirmed beforehand than go to the theatre with hope, I think. How very disappointing. But I'm glad you saw it first and shared all about it so I can brace myself for the inevitable when I watch it. Why do movie-makers feel the need to impose completely foreign plots to perfectly good books? Oh, how disappointing. We were looking forward to seeing this with our tween. And since you and I have the same favorite parts and the same passion/love for the book, I'm afraid my reaction would be similar... We'll probably still see it, but I wish they had done a better job. We finally saw it yesterday. My reaction wasn't quite as negative as yours, but I don't understand why they changed it up so much either. I actually thought it was HARDER to follow than the book...although maybe that's just because I was confused that the order was changed up. If you've never read the book it might not seem confusing at all. Dawn Treader is actually one of my favorite books and I was really looking forward to seeing how they would do it! I agree with you about Eustace...he was PERFECTLY cast! Love you're review, and am also a little scared now. I haven't seen the movie, and quite different from everyone else, Voyage of the Dawn Treader is one of my favorite Narnia books. Unfortunately I no longer want to see the movie as it seems my favorite book is ruined by the addition of green gas (green gas...really? )I was severely disappointed in their Prince Caspian movie. Guess I'll stick to good ol' bbc versions.